migration? We did and found Cornell Lab of Ornithology answered this question in their first report on numbers of birds migrating over the US from data gleaned from radar reports. Radar ornithology is an emerging field and is becoming increasingly important for determining bird migration numbers, patterns and densities, etc. By looking at weather radar, scientists are able to determine flight altitude, speed, direction and numbers of birds in the air as computer algorithms parse bird data from weather data. 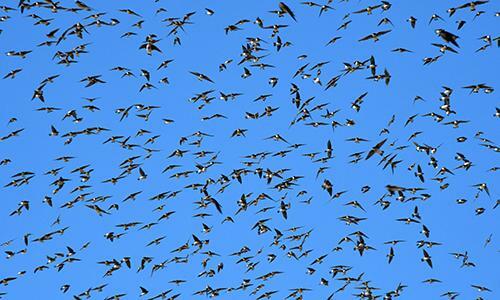 According to Cornell’s report, it looks like about 4 billion birds fly south across the Canadian border and into or through US airspace during fall migration. Keeping in mind fall migration includes recently hatched chicks taking their first trip south, in the spring, the return migration into Canada was lower at 2.6 billion birds. Many of these birds are short distance migrators. Across the southern US border into Mexico, often there are longer distance migrants – some of which may go to the farthest southern tip of South America. There were 4.7 billion of these birds who crossed our southern border, and 3.5 billion of them returned from their southern overwintering sites in spring. The return rate for long distance migrators was higher than short distance. Why is that? Scientists have a number of theories why that happens, and it may in part have to do with the higher number of eggs laid by longer distance migrators who face much greater odds against survival for the sheer distance and challenges migration provides. And while the survival rate of birds who migrate longer distances seems to be better than those on short distances, when longer distances are covered, there is more potential for the put down spot you were expecting to be able to feed and safely rest at to be diminished or changed from year to year. So, in the long run, longer distance migrating birds are more sensitive to habitat and environmental changes – especially in their overwintering spots in Central and South America. Get the full story in this article from Cornell Lab of Ornithology.